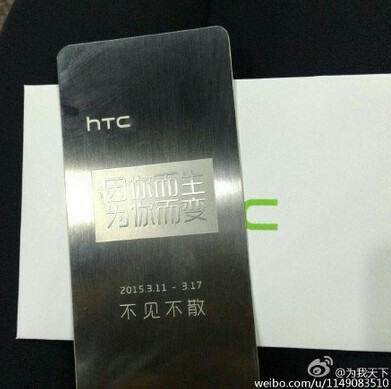 HTC has sent out invitations in China for an event most likely involving the HTC One E9. The dates listed on the invites show that whatever HTC is inviting the media to, it will run from March 11th through March 17th. There is talk about the a Chinese version of Sense being revealed, or the unveiling of the HTC One M9 Plus. The HTC One E9 is a phablet with a 5.5-inch screen carrying a resolution of 1440 x 2560. It is powered by a 64-bit octa-core MediaTek MT-6795 CPU. A PowerVR G6200 GPU crunches the graphics. 3GB of RAM is on board along with 32GB of native storage. A 20MP camera graces the back of the handset while a 4MP Ultrapixel camera adorns the front of the unit. The 3000mAh battery keeps the lights on and Android 5.0 is pre-installed. HTC's Sense 7.0 runs on top of Android. Speculation has the HTC One E9 being sold in China for $320, which would be a pretty reasonable price for such a well-spec'd phone. The period covered by the invitation starts tomorrow, so we should soon be hearing more about the fun and festivities that HTC has planned in China. The HTC One E9 isn't expected to be sold outside China. $320 only eh? Then the Phone has to perform worse than the E9 then! Look: 1) E8 has an all plastic build. This a step down of the materials that was on the HTC M8 and is following the trend this year. 2)Camera. Possibly no Dual Tone Feature, but the 20MP will make up for it. 3)Display. I'm pretty sure that the QHD display won't be as good as the main star of HTC's flagship phablet, the One Max+. There has to be a change here too. Can't edit my comment. What I'm going to add, is the only looking forward to this device is the chipset. The MediaTek 6795...hardly any benchmarks and rarity on this thing, but I believe it will do well to take the risk and swap it than using the fabled Snapdragon 810 that took us by storm. Japan bound Butterfly always seems to be the best HTC, besides the hyper-glazed plastic design, it has the best specifications. As long as they dont put on a glossy plastic body on the E9 then I'm game. The camera on the E8 was a fail.